I have a new favorite puppy chow! 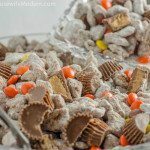 Reese’s Peanut Butter Cup Puppy Chow. Or muddy buddies, if you prefer. I grew up calling it puppy chow. But then I moved to Washington State and- when I talked about eating puppy chow- people thought I was talking about literal dog food. Muddy buddies made with peanut butter, milk chocolate, and Reese’s peanut butter chips. Reese’s peanut butter cups. A dash of Reese’s pieces. Heaven. It’s easy to make. And if you have kids, they can toss the coated cereal in the powdered sugar…just make sure the Ziploc is sealed tight! If you’re a Reese’s fan, you might also be interested in my Reese’s Peanut Butter Cheese Ball. 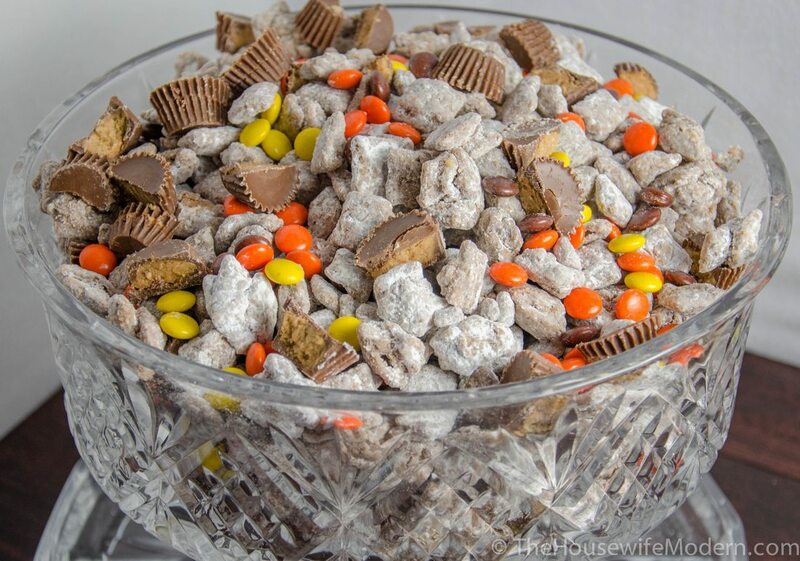 Reese's Peanut Butter Cup Puppy Chow. 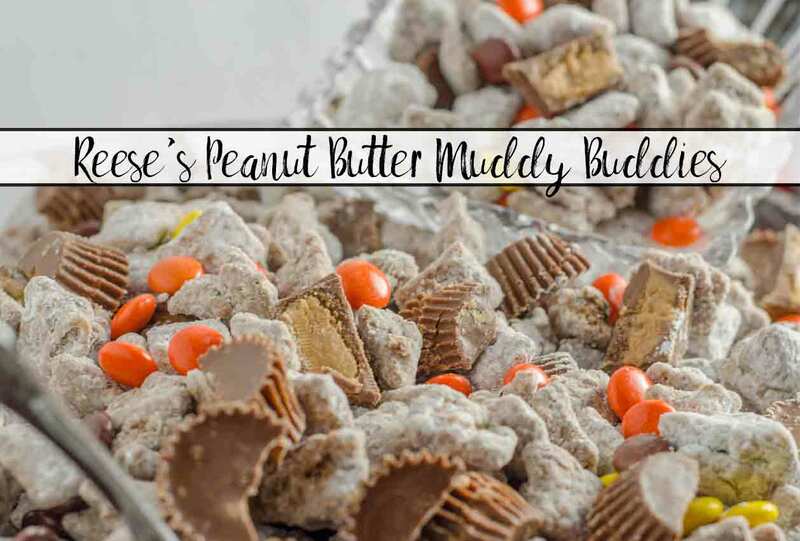 Muddy buddies made with peanut butter, milk chocolate, peanut butter chips, with Reese’s Peanut Butter Cups and Reese’s Pieces to top it off. Heaven. Pour chocolate Chex into large mixing bowl. In a separate bowl, melt 3/4 C. peanut butter chips, 3/4 C. milk chocolate chips, 1 C. peanut butter, & 1/6 C. butter. Microwave for 30 seconds at 50% power. Stir well. Repeat until melted. Pour peanut butter/chocolate over Chex. (Might not use all of it). Stir gently to coat all of the cereal. In a gallon Ziploc bag- add 1 C. powdered sugar & half of coated Chex. Gently toss, breaking apart any clumps, until well-coated and they don’t stick. Spread out on a cookie sheet to dry. In same bag- add another cup powdered sugar and other half of coated Chex. Repeat process to coat. Spread out on cookie sheet to dry. Pour vanilla Chex into a large mixing bowl. While Chex is drying, cut (or break) Reese’s Peanut Butter Cup Miniatures in half. After everything is dry, layer (or toss together) in a large bowl. Use as many peanut butter cups and candies as you prefer- you may not use them all. Hide what you want for yourself because this disappears quickly! Thank you for visiting my site. And thanks for the invite to share! Just dropped by and shared it. 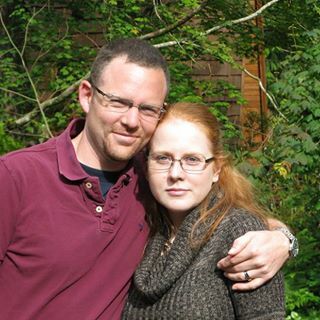 Hope to see you around here again. Wow. This is my kind of treat. I love peanut butter and chocolate combination and I love Reese’s (it’s really the only candy besides plain chocolate I eat anymore). It probably wouldn’t be as kid friendly, but I bet it would taste amazing with dark chocolate and dark chocolate PB cups. Mmmm I’m drooling just thinking about it. Hmmm….that’s a good idea. I might have to make a version of Puppy Chow that includes Dark Chocolate. They make dark chocolate PB cups? Oh, my! I’ll have to find those. Thank you for visiting! And another thank you for commenting. I love hearing from readers. I was honestly going to use all chocolate Chex. But the store only had one box! haha. So I made half vanilla. But I think it worked out all right so I changed the recipe. Thank you for visiting and for taking the time to comment. I really appreciate it.